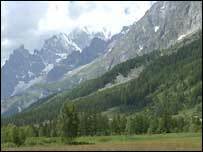 The body of a climber has been found 17 years after he died in a mountaineering accident in the French Alps. Mike Seavers was part of an ill-fated climbing party which attempted to scale the 15,000ft (4,572m) Mont Blanc when they were caught in a severe storm. The bodies of the 31-year-old from Bristol and a German member of the party were found in a melting glacier. Mr Seavers' father Ian, from Stansted in Essex, said he was arranging to have his son's remains returned home. "It's something we've been living with for the past 17 years," he said. "It's been a little trying on the emotions but this has come as a big relief." Mike Seavers lived in Bristol after studying geology at Bristol University. He worked for the oil industry, but had been hoping to set up his own outdoor pursuits business. Nick Colton, from the British Mountaineering Council, said the bodies of Mr Seavers and his friend had obviously been preserved by the ice. "They may have gone inside a crevasse to take cover and got covered, possibly by an avalanche or snowfall. "Glaciers are flowing things. They move at an imperceptible speed and anything travels with it encased in ice. "When they get to a point where the glacier melts, things appear." It is not the first time a climber has been found several years after going missing. In 1999, an expedition to Mount Everest found the body of the famous British climber, George Mallory, who disappeared seventy-five years earlier, a short distance from the summit.